Paris, chez l'auteur, 1680. Folio. With large woodcut vignette on letterpress title-page, a woodcut headpiece, 2 woodcut decorative initials, decorations built up from cast arabesque fleurons, an engraved calligraphic title-page and 22 (of 23) engraved leaves with calligraphic writing samples and illustrations, all engraved by Louis Senault. Contemporary calf, gold-tooled spine, and unusual marbled paste-downs. 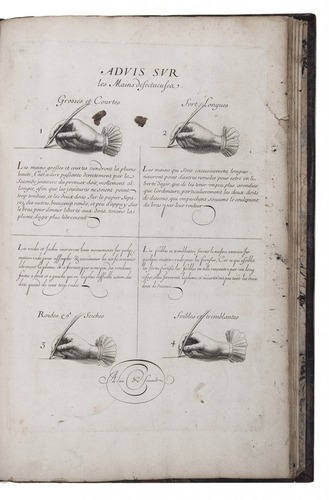 First edition of a very elaborate basic writing course and copy book, minutely explaining the composition of the various calligraphic hands (françoises, bâtardes, financieres), as well as pen decorations and drawings. The engraved title-page reads, "L'art d'écrire ou Le moyen d'exceler en cet art sans maistre" (suggesting a break with the ancient tradition of learning by apprenticeship or under a school master). The writing examples include numerous exercises of single letters and many alphabets. It also includes illustrations of posture at the writing table, the way to hold the pen and nibs with the angle of cutting and of the nib to the paper. Instructions are often added as well, engraved in a small neat hand, and attention is given to the lay-out of a manuscript. 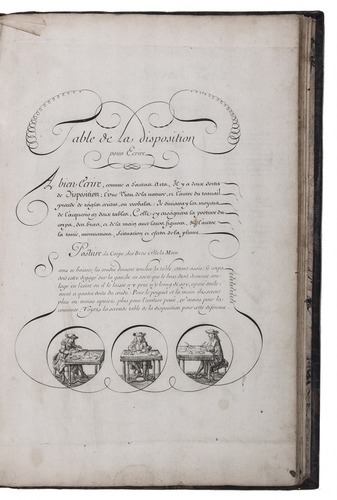 The course was designed by Jean Baptiste Allais, dit le Beaulieu, and engraved by Louis Senault, who was a leading writing master in his own right and therefore ideally suited to engrave his colleague's writing book. At this date the pointed pen was replacing the broad-nibbed pen, and one of the illustrations present here shows the nib of a pointed pen with the split tip spread open. Some copies were issued with only 4 letterpress leaves (quire A) and many copies are missing letterpress leaves or plates. With several calligraphic exercises by owners on the endpapers, one with "Fait par moy René Brisson", another "fait par moy Bernard le Brot[?] ... a Paris" and a calligraphic title signed "Guerbois fils". Lacking the leaf on cutting the pen (which included no writing samples), but otherwise a good copy, with one decorative flourish on the title-page shaved, and some spots and stains. The binding is worn, with some cut marks and scrapes, and 3 small parts of the backstrip have been restored with gold-tooling. A rare, attractive and detailed 17th-century French writing book in a contemporary binding. Becker, Practice of letters 91 (without [pi]1-2, B1-2); Berlin Kat. 5117 (lacking [pi]1-2, A1); Muller, Cat. Calligr., 1 (22 ll. ); Marzoli 56; not in Ekström Coll.